What connection can Spode possibly have with pineapples? In the 21st century this exotic fruit has become almost common place finding its way into UK supermarkets and, chopped up, included in pre-prepared lunchboxes. Over 200 years ago it was a thing of wonder and you could show off your wealth with the purchase of pineapples or even by cultivating them on your grand estate. You could then display the fruit in the centre of a well-laid dessert table arranged on a specially made stand by that supreme ceramic manufacturer - Spode. The pineapple stand shown with the pineapple in situ is made from bone china and is in Flower Embossed shape. It was made in about 1818 and is marked Spode in red. The 'embossed flower' decoration is actually part of the mould from which the object is made and is left undecorated - just the pure white of the bone china looking striking against the fashionable apple green colour of the period. 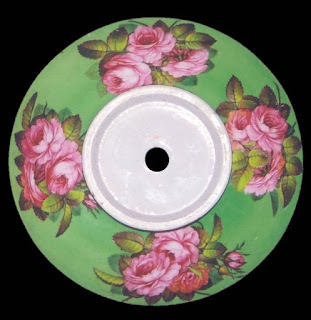 The groups of pink roses and leaves are hand painted and the whole finished with gilding. There is even more to this showy piece as the underside is also decorated. The fashion for laying dessert wares onto mirrors on a table meant that any usually hidden gilding or painted detail could be seen - truly a design full of opulence. Dessert services from Spode could comprise hundreds of pieces so other items were probably made in this design and a whole spread would have looked magnificent whether in use or on show. The pineapple would still have had a woody stem attached to it when picked and this slotted through the central hole of the stand so it did not topple over. Slices from another pineapple or other fruits were laid around the edge to serve to guests. There are stories of when the catering was provided by an outside firm for a grand occasion (rather than in-house), such was the expense of the pineapple at this time, that the whole fruit was rescued and carried off to be used as the uneaten centrepiece for another occasion at another location! At the Lost Gardens of Heligan in Cornwall they revived the growing of pineapples in 1997, relearning the skills and reviving the 'pineapple pit', presenting one of the first fruits grown to the HM Queen Elizabeth II for her 50th Wedding Anniversary. 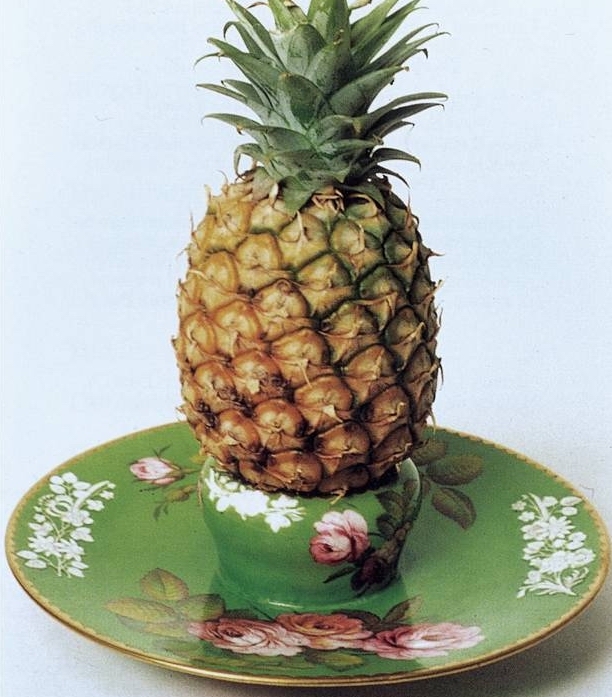 Another design of pineapple stand was also produced by Spode at the same period. It can be seen in a drawing from the Spode 1820 Shape Book where it is described as 'Pine Pedistall' and was available in 2 sizes. Although the 'Pine Pedistall' looks a little uninspiring here I have seen one in this style although they are very rare. It is part of the collection of the Spode museum generously given as a gift to the collection in about 1997. It was decorated in the most beautiful Imari style in Spode's pattern number 1609 first recorded in about 1811. Another Spode pineapple stand is this wonderful white one in the collections at the V & A in London. This is a very elegant design beautifully crafted in all respects - shape, pattern and quality of manufacture. The simple decoration enhances the pure white of the bone china simply consisting of stylised pineapple leaves painted and gilded. I see from the website V & A Ceramics that this was part of the Gulson Bequest which means it is highly likely this piece belonged to the Spode family. Fashions come and go and sometimes objects are so far removed from our everyday knowledge that their use is misunderstood and often objects are discarded. The 'Pine Pedistall' is one of these. There are other 'curious' objects recorded in the Spode archive. One of these records refers to Pyramids. Intrigued? Click/tap here for my research on 'Spode, Desserts and Pyramids'. 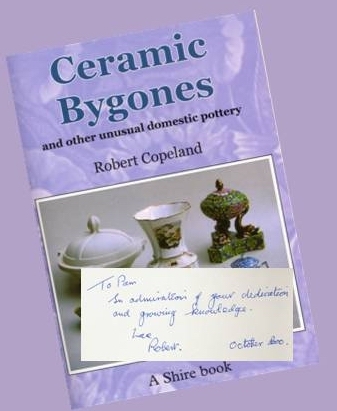 If your curiosity is stirred by unusual objects from Spode you can consult Ceramic Bygones and Other Unusual Domestic Pottery by Robert Copeland, published by Shire in 2000. You can see the front cover of my treasured copy here with the lovely dedication from the author. To find out more about the cultivation and growers of pineapples in the 18th century visit Nursery Gardeners to read about the Scott brothers. And for still more on pineapples in art and design visit a great blog post by Fabrice Bana of A-Gent of Style entitled 'Prickly Subject: The Pineapple Extravaganza' by clicking here.